double bed, double glazing, heating, hot water, split level flat, big room to yourself, great transport links…? unbuilt showers and toilets, no sinks, no taps or running water, having to wash oneself with buckets of cold water, shared room with four people…? Maybe the heat’s gotten to me already. 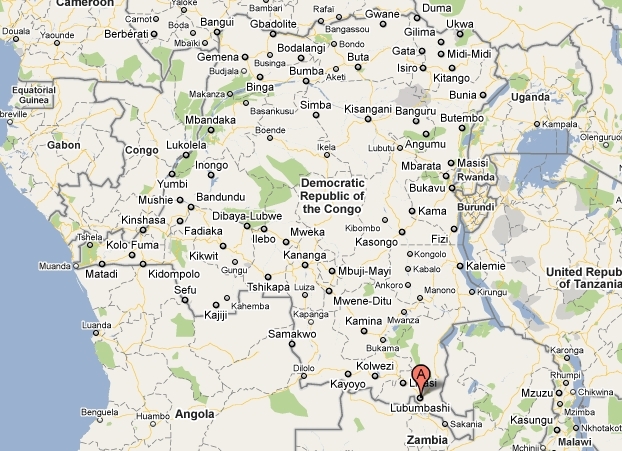 So I’m currently staying in Lubumbashi, the second largest city in the DRC, based right down in the south-east corner, bordering Zambia. As many of you may know, I have come out here with a new job. I am now working for the Frankfurt Zoological Society as the Communications Officer for a new conservation project – the rehabilitation of Upemba National Park. Through years of mismanagement, poaching and general violence, the park has found itself completely neglected. And not only that, but almost completely devoid of any wildlife as a result. The severe impact that poaching and violence have had on the environment in the Katanga Province (where we, and the park, are based) and elsewhere in the country is, quite frankly, staggering. And criminal. and reintroduce wildlife into the park, once the above have been completed. And my role, in a nutshell, is to raise global awareness of the project. This will (hopefully!) be done through a varied communications platform that includes developing a website, using social media and getting media coverage, while also aiming to raise funds through the website. The project has been funded for two years by the EU and the World Bank, and we are also working very closely with the Congolese government. But the two-year funding is all we have at this stage, hence the need for online funding to keep the money pot ticking over… What happens after the two years is down to us and down to the success of the project. No pressure then. What’s more is that this will be the first time FZS go into a park that is not already established, and with an aim of starting a conservation project from scratch. Success, therefore, can’t really be measured against anything they’ve done before…which can be seen as both positive, and negative, depending upon the result! One thing I can say for certain though is this: we have our work cut out. Our headquarters for this project are currently in Lubumbashi. And they will serve as a permanent base for FZS down the line. 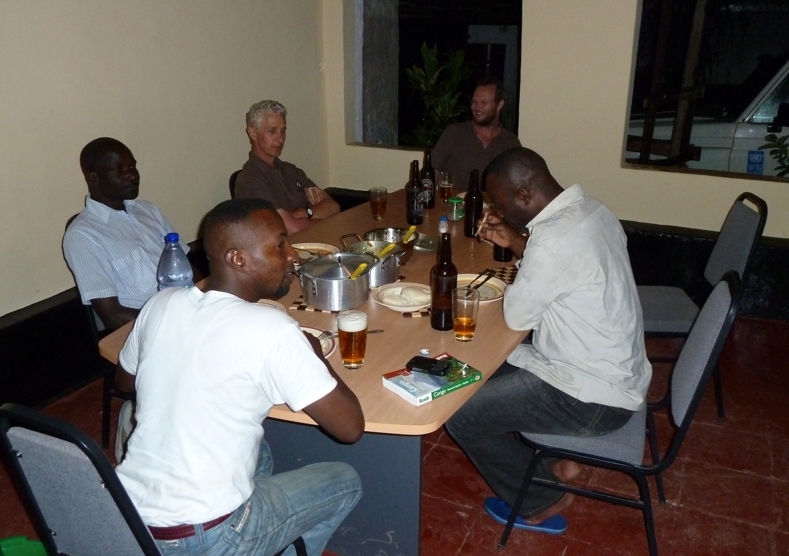 Here with me are Rob (DRC Programs Director), Alan (Upemba Project Leader) and a number of Congolese staff called Urbain (DRC Programs Deputy), Pactole (Finance), Prince (Logistics) and Atamoto (Lead Conservationist for Upemba). This is us having dinner the other night. They’re all lovely guys and good to work with. Around the end of April, Alan and I will then move into the park and set up a permanent base there for this project. We hope. It all depends on how preparations go from this end – there’s still a lot that needs sorting out, and as some of you may have guessed or may already know (from experience), things take their time over here. It seems to be the African way. Yet despite its frustrations, it’s great to be back in Africa. My first experience was back in 1994, on a school cricket tour to Zimbabwe. That was an unforgettable experience, and I still have my scrapbook project at home somewhere! And then three years ago I spent a few weeks in Zambia and travelled up to Tanzania, where I spent a month and a half volunteering with the Amani Children’s Home, climbing Mount Kilimanjaro and seeing other parts of the country. It was a life-changing experience, a truly exceptional time in my life. And now, a seemingly hair-brained and unrealistic idea back in December (2010) to go for this job has finally turned into reality. Funny how life turns out, isn’t it? WoW! that sounds like an incredible job you’ve landed! Good luck! And keep the blog posts coming. We’ll try to retweet etc. Do you have any security concerns or worries about the corruption that might mean you have to pay for everything twice? Also, what type of wildlife are you going to be populating the park with when it’s ready? Hi Rob, thanks for your comments and your support! Much appreciate the retweets! This is currently a personal blog but the plan is to start a blog (and separate social media strategy) for the Upemba project when we have all our team in place. That should hopefully be within the next month, at the latest. With these different types of comms I hope to be able to delve further into all aspects of the project and to really shed some light on what we’re doing and what we’re coming up against. In terms of wildlife, we will have to wait and see how everything progresses. 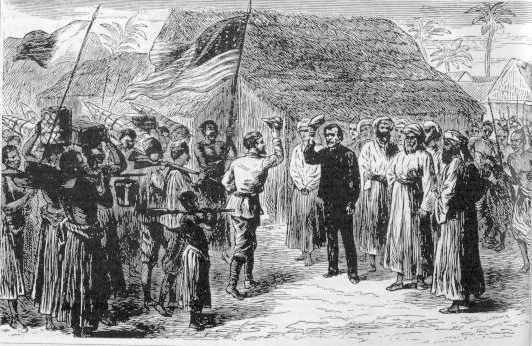 Zebra have an important role in both the history of the Congo and the Katanga province though, so they will play a key role going forwards, certainly to begin with. There’s a very interesting back-story to the zebra which I will write about down the line. And in terms of security, things at this point seem ok. There will no doubt be obstacles that come up but we will be looking to keep ourselves far away from all forms of corruption. I think with enough belief, conviction and dedication, as well as help from the right people, this project can really go places. Watch this space…! Sounds like a great venture. I wish you well. He’s got a somewhat different remit but I think he’s been in DRC for years and might be worth an email. its ian here! karibu ku lubumbashi! great to read your blog! do get in touch, my phone number is 0991537982 and my email address is ian@congochildrentrust.org if you are free on friday evening there is the monthly jazz night at halle de l’etoiles, normally a fun night, see you there? How annoying. just wrote you a massive message and then the internet crashed. ugh stupid uni internet, probably on a par with your connection LOL. ok well anyway, i was just saying how much i love the blogs!!! keep them coming, they make my day reading them. you shall be happy to know that i have made this my homepage for the internet, so as soon as a new blog is updated I SHALL KNOW!!! !